J2Store is a popular eCommerce platform for the Joomla Content management system. J2Store comes with a Campaignrabbit integration built-in. Enter the API Key and the API Secret in the respective fields(You can get these from the “Settings” section of Campaignrabbit app ) Once when the authentication message is “Success”, you can see that your store is connected and the orders and customers start flowing in. Once connected, your store can automatically send the new orders and customers to Campaignrabbit. That is seamless. You can also synchronize your existing customers and orders to Campaignrabbit as well. NOTE: It is just a one time process. No need to repeat it. Go to J2Store -> Apps and open the Campaignrabbit app. Navigate to “Order and Cron job” settings. Copy the CRON URL. Now open the Cron Job manager in your hosting cPanel and add a cron job. There is a documentation in J2Store that explains the cron job process in detail. Navigate to the Synchronize tab. Click “Synchronize Customers” and “Synchronizse Orders” buttons. 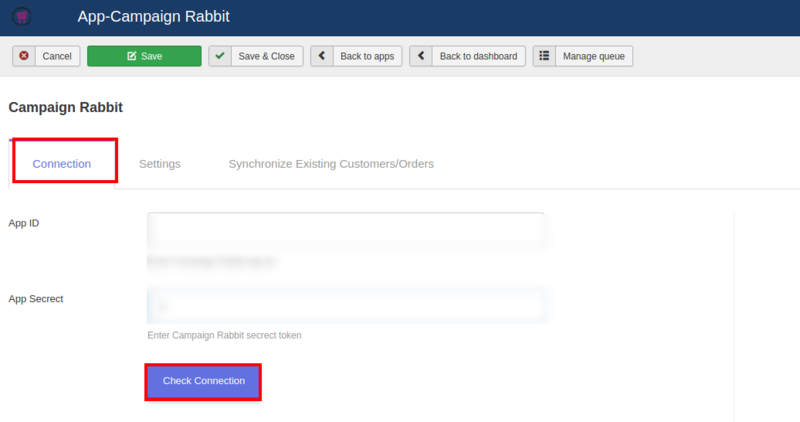 This will initiate a sync and you can see that the existing customers and order data are synced in Campaignrabbit.